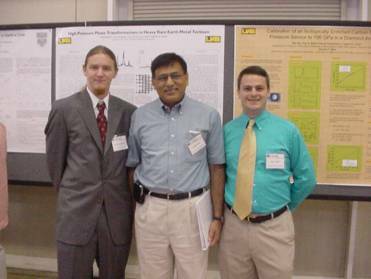 Dr. Vohra with physics graduate Students Nick Cunningham and Joel Griffith at the Advanced Photon Source in Chicago. 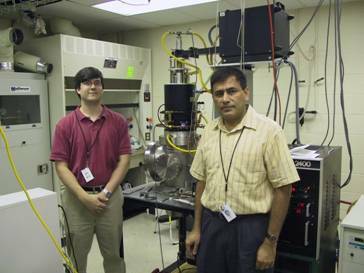 Dr. Vohra with materials science graduate student Paul Baker with the 6 kW microwave Plasma Chemical Vapor Deposition system at UAB. (1) Growth and Characterization of Nanostructured Materials (www.phy.uab.edu/Research/NanoscienceResGroup/NNGIndex.htm) : In this program, we focus on the growth of nanostructured materials by chemical vapor deposition and pulsed laser deposition techniques. These nanostructured coatings contain diamond particles or carbon nanotubes with characteristic dimensions in the 5-50 nm range in an amorphous matrix. These coatings are deposited on a variety of metallic substrates like titanium alloys, cobalt chrome, molybdenum, and rhenium. These nanostructured materials are characterized by a variety of techniques including Raman spectroscopy, thin film x-ray diffraction, Atomic Force Microscopy, Nanoindentation hardness and adhesion measurements, and electron microscopy. (2) Chemical Vapor Deposited Single Crystal Diamond and Designer Diamond Anvils (www.phy.uab.edu/research/DOE/Index.htm): In this program, we focus on the growth of high quality single crystal diamond using microwave plasma chemical vapor deposition technique. In collaboration with Lawrence Livermore National Laboratory, designer diamond anvils with encapsulated microcircuits have been fabricated for applications in high-pressure research. These designer anvils have been successfully tested to megabar pressures in a diamond anvil cell device. In this group, efforts are also underway to grow a 10 mm synthetic diamond mono crystal with chemical vapor deposition technology. (3) High Pressure – High Temperature Materials Research (www.phy.uab.edu/research/HighPresMatGroup/HPMGIndex.htm): This program is focused on the phase diagrams of rare earths and actinide metals, Fullerenes C60 and C-70 at high pressures and temperatures. These materials are studied in a diamond anvil cell using laser spectroscopic and x-ray diffraction techniques. The x-ray diffraction studies are carried out at the X-17C beam line at the National Synchrotron Light Source (NSLS) at the Brookhaven National Laboratory and high-pressure beam lines at the Advanced Photon Source (APS), Argonne National Laboratory. Nanoindentation hardness studies are also carried out on pressure-quenched samples to investigate mechanical properties of superhard materials. § Micro-Raman/Photoluminescence Spectrometer for non-destructive characterization of materials. 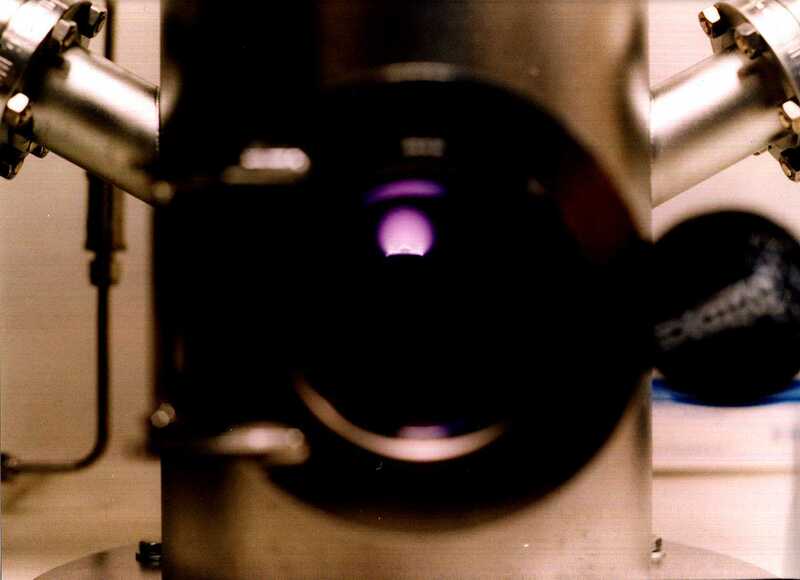 § Laser heating facility for materials synthesis at high pressures and high temperatures. § 1.2 kW and 6 kW Microwave Plasma Chemical Vapor Deposition (MPCVD) systems for diamond growth. 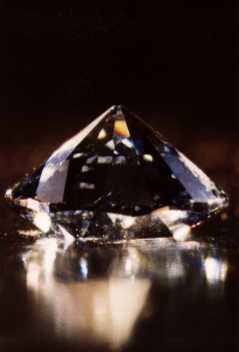 Single crystal diamond growth as well as diamond coatings on metals. § Thin Film X-ray Diffractometer. § Diamond Anvil cells for high pressure-high temperature research. § Sample preparation lab for micron-level sample assembly. § Adhesion Scratch Testing Equipment. § United States Patent Number 6,183,818 entitled “Process for Ultra Smooth Diamond Coating on Metals and Uses Thereof”, Yogesh K. Vohra and Shane A. Catledge, Date of Patent: February 6, 2001. § United States Patent Number 6,183,818 entitled "Process for Ultra Smooth Diamond Coating on Metals and Uses Thereof", Yogesh K. Vohra and Shane A. Catledge, Date of Patent: February 6, 2001. Publications: Total 200 publications in international journals in physics and materials science. 1. S. Chowdhury, Vinoy Thomas, Derrick dean, Shane A. Catledge, Yogesh K. Vohra, “Nanoindentation on Porous Bioceramic Scaffolds for Bone Tissue Engineering”, Journal of Nanoscience and Nanotechnology, Vol.5 2005. 2. S. A. Catledge, Y. K. Vohra, and P. B. Mirkarimi, “Low temperature Growth of Nanostructured Diamond on Quartz Spheres”, J. of Phys. D: Appl. Phys. 38, 1410 (2005). 3. Nenad Velisavljevic, Yogesh K. Vohra, and Samuel T. Weir, “Simultaneous Electrical and X-ray Diffraction Studies on Neodymium Metal to 152 GPa”, High Pressure Research, Vol. 25, 137 (2005). 4. D. D. Jackson, V. Malba, S. T. Weir, P. A. Baker, and Y. K. Vohra, “High Pressure Magnetic Susceptibility Experiments on the Heavy Lanthanides Gd, Tb, Dy, Ho, Er, and Tm”, Phys. Rev. B 71, 184416 (2005). 5. Randolph S. Peterson, Paul A. Baker, Shane A. Catledge, Yogesh K. Vohra, Samuel T. Weir, “Optical Defect Centers and Surface Morphology of Isotopically Enriched Diamond Layers in Designer Diamond Anvils”, Journal of Applied Physics 97, 073504 (2005). 6. Nicholas C. Cunningham, Nenad Velisavljevic, and Yogesh K. Vohra, “Crystal Grain Growth at the a-Uranium Phase Transformation in Praseodymium, Phys. Rev. B 71, 012108 (2005). 7. Hyunbin Kim, Yogesh K. Vohra, Patrick J. Louis, William R. Lacefield, Jack E. Lemons, and Renato P. Camata, “Biphasic and Preferentially Oriented Microcrystalline Calcium Phosphate Coatings: In Vitro and In Vivo Studies”, Key Engineering Materials Vols. 284-286, 207 (2005). 8. T. R. Lawson, S. A. Catledge, and Y. K. Vohra, “Nanostructured Diamond Coated CoCrMo Alloys for Use in Biomedical Implants”, Key Engineering Materials Vols. 284-286, 1015 (2005). 9. Wei Qiu, Yogesh K. Vohra, Gregory B. Thompson and Shifan Shi, "Crystal Structure and Compressibility of FePt Nanoparticles under High Pressures and High Temperatures", High Pressure Research 24, 357 (2004). 10. Shane A. Catledge, Yogesh K. Vohra, Susan L. Bellis, Amber A. Sawyer, “Mesenchymal Stem Cell Adhesion and Spreading on Nanostructured Biomaterials”, Journal of Nanoscience and Nanotechnology 4, 986 (2004). 11. Malesela J. Papo, Shane A. Catledge, Yogesh K. Vohra, Camilo Machado, “Mechanical Wear Behavior of Nanocrystalline and Multilayer Diamond Coatings on Temporomandibular Joint Implants”, Journal of Materials Science: Materials in Medicine 15, 773 (2004). 12. Marc D. Fries and Yogesh K. Vohra, “Properties of Nanocrystalline Diamond Thin Films Grown by MPCVD for Biomedical Implant Purposes”, Diamond and Related Materials 13/9, 1740 (2004). 13. Nenad Velisavljevic and Yogesh K. Vohra, “Distortion of Alpha-Uranium Structure in Praseodymium Metal to 311 GPa”, High Pressure Research 24, 295 (2004). 14. Wei Qiu, Nenad Velisavljevic, Paul A. Baker, Yogesh K. Vohra, Samuel T. Weir, “Isotopically Pure 13C Layer as a Stress Sensor in a Diamond Anvil Cell”, Applied Physics Letters 84, 5308 (2004). 15. J. R. Patterson, C. M. Arcane, D. D. Jackson, V. Malba, S. T. Weir, P. A. Baker and Y. K. Vohra, “Pressure Induced Metallization of Mott Insulator MnO”, Phys. Rev. B 69, 220101 (R) (2004). 16. Shane A. Catledge, Marc Fries, and Yogesh K. Vohra, “Nanostructured Surface Modifications for Biomedical Implants”, in Encyclopedia of Nanoscience and Nanotechnology, Edited by Hari Singh Nalwa, American Scientific Publishers, Volume 7, pages 741-762 (2004). 17. Vaibhav Vohra, Shane Catledge, and Yogesh K. Vohra, “Diamond Coated Cemented Carbide Tools: Effect of Pre-treatment Techniques on Film Structure and Mechanical Properties”, Mater. Res. Soc. Symp. Proc. Vol. 791, p. Q 8.22.1 (2004). 18. Malesela J. Papo, Shane A. Catledge, Camilo Machado, Somaieh Kashef, Alan E. Eberhardt, and Yogesh K. Vohra, “A Comparative Wear Assessment of Uncoated and Nanocrystalline and Multilayer Diamond Coated Implants of the Temporomandibular Joints”, Mater. Res. Soc. Symp. Proc. Vol. 791, p. Q 8.20.1 (2004). 19. Qi Liang, Shane A. Catledge, and Yogesh K. Vohra, “Mechanical Properties of Boron Doped Film Prepared by MPCVD”, Mater. Res. Soc. Symp. Proc. Vol. 791, p. Q 8.19.1 (2004). 20. Yogesh K. Vohra, Kevin M. Hope, J. Reed Patterson, and Jagannadham Akella, “Crystallographic Anisotropy in Compression of Uranium Metal to 100 GPa”, Mater. Res. Soc. Symp. Proc. Vol. 802, p. DD 1.7.1 (2004). 21. Nenad Velisavljevic, Kirkland M. MacMinn, Yogesh K. Vohra, and Samuel T. Weir, “Electrical Measurements on Praseodymium Metal to 179 GPa Using Designer Diamond Anvils”, Applied Physics Letters, Volume 84, 927 (2004). 22. S. A. Catledge and Y. K. Vohra, in Mechanical Properties Derived from Nanostructuring Materials, eds. H. Kung, D.F. Bahr, N.R. Moody, K.J. Wahl, MRS Proceedings Vol. 778, p. U7.8.1, Pittsburgh, PA (2003). 23. Qi. Liang, Shane A. Catledge, and Yogesh K. Vohra, “Effect of Nitrogen Addition on the Morphology and Structure of Boron-Doped Nanostructured Diamond Films”, Applied Physics Letters 83, 5047 (2003). 25. Shane A. Catledge, Monique Cook, Yogesh K. Vohra, Erick M. Santos, Michelle D. McClenny, and K. David Moore, “Surface Crystalline Phases and Nanoindentation Hardness of Explanted Zirconia Femoral Heads”, Journal of Materials Science: Materials in Medicine 14, 863 (2003). 26. Nenad Velisavljevic and Yogesh K. Vohra, “Bioceramic Hydroxyapatite at High Pressures”, Appl. Phys. Lett. 82, 4271 (2003). 27. H. Kim, Y. K. Vohra, R. P. Camata, and W. R. Lacefield; “Mechanical properties of pulsed laser-deposited hydroxyapatite thin films for applications in biomedical implants,” in Surface Engineering 2002: Synthesis, Characterization and Applications. (Mater. Res. Soc. Symp. Proc. vol. 750, A. Kumar, W.J. 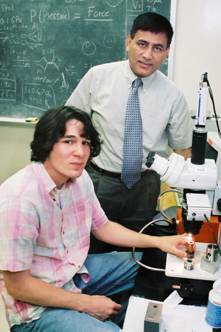 Meng, Y-T. Cheng, J. Zabinski, G.L. Doll, S. Veprek, editors (2003), page 71. 28. S. A. Catledge, Yogesh K. Vohra, S. Woodard, and R. Venugopalan, “Structural and Mechanical Properties of Nanostructured Metalloceramic Coatings on Cobalt Chrome Alloys”, Appl. Phys. Lett. 82, 1625 (2003). 29. D. D. Jackson, C. Aracne-Ruddle, V. Malba, S. T. Weir, S. A. Catledge, Y. K. Vohra, “Magnetic Susceptibility Measurements at High Pressure Using Designer Diamond Anvils”, Rev. Sci. Instrum. 74, 2467 (2003). 30. Shane A. Catledge, James Borham, Yogesh K. Vohra, William R. Lacefield, and Jack E. Lemons, “Nanoindentation Hardness and Adhesion Investigations of Vapor Deposited Nanostructured Diamond Films”, Journal of Applied Physics 91, 5347 (2002). 31. Raymond B. Corvin, Joseph G. Harrison, Shane A. Catledge, and Yogesh K. Vohra, “Gas Phase Thermodynamic Models of Nitrogen Induced Nanocrystallinity in Chemical Vapor deposited Diamond”, Applied Physics Letters 80, 2550 (2002). 32. Nenad Velisavljevic, Gary N. Chesnut, Yogesh K. Vohra, Samuel T. Weir, Vince Malba, and Jagannadham Akella, “Structural and Electrical Properties of Beryllium Metal to 66 GPa Studies Using Designer Diamond Anvils”, Physical Review B 65, 172107 (2002). 33. Shane A. Catledge, Marc D. Fries, Yogesh K. Vohra, William R. Lacefield, Jack E. Lemons, Shanna Woodard, Ramakrishna Venugopalan, “Nanostructured Ceramics for Biomedical Implants (Review Article)”, Journal of Nanoscience and Nanotechnology Volume 2, 293 (2002). 34. J. Reed Patterson, Anatoliy Kudryavtesev, and Yogesh K. Vohra, “X-ray Diffraction and Nanoindentation Studies of Nanocrystalline Graphite at High Pressures”, Applied Physics Letters 81, 2073 (2002). 35. Chih-Shiue Yan, Yogesh K. Vohra, Ho-kwang Mao, and Russell J. Hemley, “Very High Growth Rate Chemical Vapor Deposition of Single-Crystal Diamond”, Proceedings of the National Academy of Sciences 99, 12523 (2002). 36. Marc D. Fries and Yogesh K. Vohra, “Nanostructured Diamond Film Deposition on Curved Surfaces of Metallic Temporomandibular Joint Implant”, Journal of Physics D: Applied Physics 35, L105-L107 (2002). 37. Yogesh K. Vohra and Samuel T. Weir, “Designer Diamond Anvils in High Pressure Research: Recent Results and Future Opportunities”, Proceedings of the International School of Physics – Enrico fermi, Course CXLVII, R. J. Hemley, G. I. Chiarotti, M, Bernascoini, and L. Ulivi (Eds. ), pp 87-105, IOS Press, Amsterdam 2002. 38. E. A. Smirnova, R. Ahuja, Y. K. Velikov, B. Johansson, Y. K. Vohra, I. A. Abrikosov, “Effect of Band Filling on the Pressure Induced Structural Transition in Mo-Re Alloys”, Physical Review B 66, 024110 (2002). 39. Paul. A. Baker, Shane. A. Catledge, Yogesh. K. Vohra, “Low Temperature Growth of Nanostructured Diamond Films”, J. Nanosci. Nanotech. 1, 31 (2001). 40. Jeremy R. Patterson, Yogesh K. Vohra, Samuel T. Weir, and Jagannadham Akella, “Single-Wall Carbon Nanotubes Under High Pressures to 62 GPa Studied Using Designer Diamond Anvils”, J. Nanosci. Nanotech. 1, 143 (2001). 41. Yogesh K. Vohra, and Philemon T. Spencer, “Novel g-Phase of Titanium Metal at Megabar Pressures”, Phys. Rev. Lett. 86, 3068 (2001). 42. K. Iakoubovskii, G. J. Adriaenssens, and Yogesh K. Vohra, “Nitrogen Incorporation in CVD Diamond”, Diamond and Related Materials 10, 485 (2001). 43. S. A. Catledge and Y.K. Vohra, “Effect of Nitrogen Feedgas Addition on the Mechanical Properties of Nano-structured Carbon Coatings”, Mechanical Properties of Structural Films, ASTM STP 1413, C. Muhlstein and S. B. Brown, Eds., American Society for Testing and Materials, West Conshohocken, PA, page 127, (2001). 44. Shane A. Catledge, Philemon T. Spencer, Jeremy R. Patterson, and Yogesh K. Vohra, "Nanoindentation of Pressure Quenched Fullerenes and Zirconium metal from a Diamond Anvil Cell", in Fundamentals of Nanoindentation and Nanotribology II, Editors: S.P. Baker, R.F. Cook, S.G. Corcoran, N.R. Moody, Materials Research Society Proceedings Volume 649, Q7.24, 2001.